Overall, a good boardgame rendition of an FPS. The character cards are fun in general as you get your own and can mark them up as the game progresses. Don’t play vs your significant other tho, it can get brutal! Fun gameplay, but can be a drag if you keep getting nailed, it’s tough to get all your stuff back in the larger games. Tough to get back on your feet if you get killed in the larger games. Pretty fun game in general, though for me was good once per night. 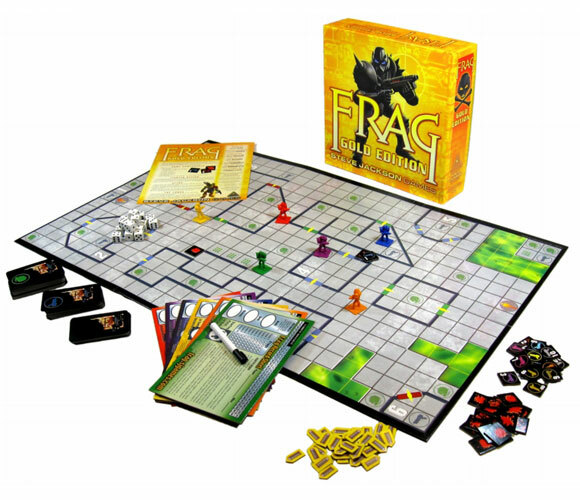 Frag is one of those fun games that doesn’t pretend to be more than it is. Its tagline, “The first person shooter, without the compute” sums up the play nicely. Each player takes the role of an in-game soldier. Your goal is to rack up as many frags (killing other players’ soldiers) as you can. Note that BEING fragged does not count against you, just like in the games. It’ll set you back a little, but respawning is just part of the game. You’re actually working at a bit of a meta-level above the game too. In the game, you can collect extra weapons and equipment, but it is also possible to get game hacks and better video-game hardware. My sons liked this aspect of the game as much as the weapons. 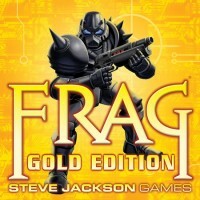 Add a Review for "Frag Gold Edition"